I wonder how soon schools will stop buying textbooks in favor of all the great information online. I've never felt married to my science text before, but this year I have found so much great online content for teaching weather to my fourth graders that I just had to share! My "segue" to my weather unit always starts with a review of solid liquid and gas. 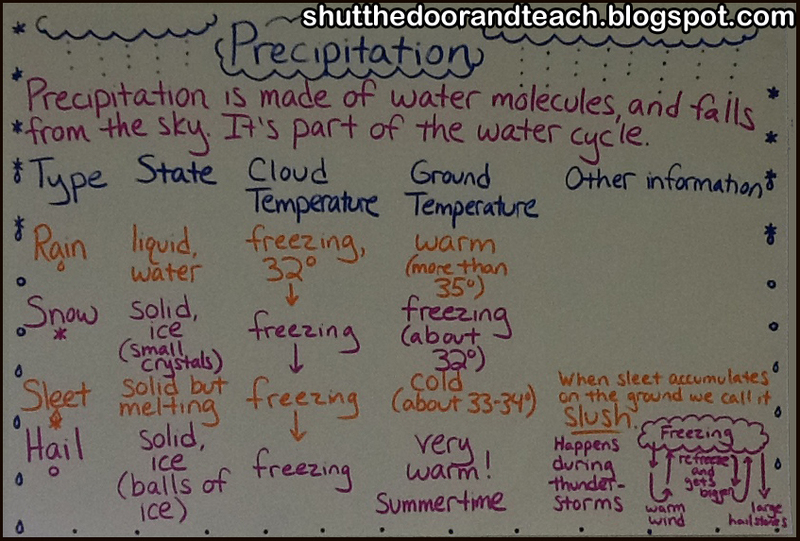 Then we talk about the water cycle. Although science books tend to have nice diagrams, I feel like they can't compete with an animation. 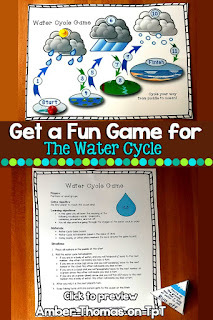 This year I showed my students this short video on the water cycle as a whole class. 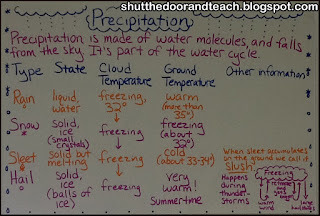 Then I had them each go view this water cycle animation to learn at their own pace. Since there is no sound, it was fine for a whole class to go on at the same time on individual computers (we don't have enough headphones to go around). And they can take their time reading the labeled parts and watching the arrows move. Next we always focus on clouds for a lesson. I give the kids a drawing lesson using clouds and smart background color choices for paper, and they represent three cloud types: Stratus, cumulus and cirrus. It's no accident that I placed the stratus lowest and cirrus up high on the display, since their actual elevation is relative in nature. This year, along with notes on all three, I also had the kids write a short note (it almost could have been a text) to a friend asking them on a play date in two days, and it had to be conducive to the type of weather they were expecting, based on the cloud types. This was a big hit! 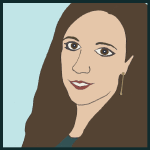 It was a very short, to the point writing assignment, and it was very relevant to their lives. I let the kids know, "These are not the only 3 cloud types that exist, so if you look in the sky and can't tell what they are one day, don't feel bad. For that matter, after learning the fourth grade unit on weather, please don't expect that you'll be able to accurately predict the weather 100% of the time. Even the meteorologists can't do that." They laugh, and I feel like they do feel invested in learning what causes weather events, even though they know they don't have the WHOLE story yet. Next, we talked about air masses that create fronts. Instead of doing a demonstration on warm air rising and cold air sinking, I showed them this very short video involving the movement of hot and cold liquid, differentiated by colored food dye. Free, and no mess! Easy enough for kids to try at home. 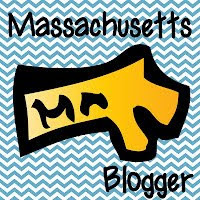 Next we watched a fun little cartoon about fronts, a more realistic animation of cold and warm fronts, and our FAVORITE...BY FAR, was a parody of "Keep Your Head Up" by Andy Grammer, which is all about air masses and fronts. Most of it is way too advanced for fourth grade, (it was written and performed by a 6th grade science teacher) but it was great for my gifted student, piqued the interest of my more curious students, and entertained my musical students! To keep it relevant I just encouraged them to remember the bridge and they were happily singing along. I knew the unit struck a chord when one of my students told me last week, "Mrs. Thomas, look, it rained, so now the stratus clouds are going away. We're going to have good weather. It will probably cool down, too." 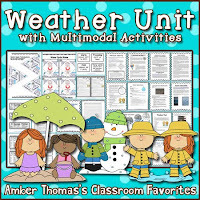 If you are looking for more help teaching weather, my weather unit is now available for you!